The cornerstone of outstanding putting greens and short-game practice facilities is PAR Turf™, our Pure Absolute Roll™ turf product line. 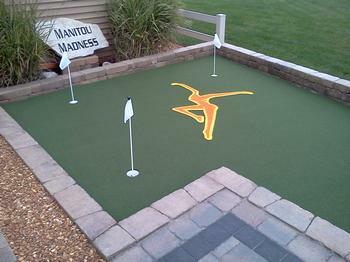 — What makes your artificial putting surface unique? After extensive testing on dozens of options, we determined that our exclusive PAR Turf™ series turf best simulated a natural grass surface. If you've ever putted on synthetic turf before, you probably noticed a "wobble" as the ball came to a rest. Not with PAR turf! Our special "tufting" process has eliminated the "wobble" - plus, there is no grain in our proprietary nylon PAR turf, allowing putts to roll the same speed in every direction! — How well does your turf hold up outdoors? Our turfs are assembled using the finest UV-treated polypropylene & nylon, water-resistant fibers. Our turf carries a 10-year limited warranty against excessive wear and fading, and resists normal rain, snow, wind, freeze and sun. 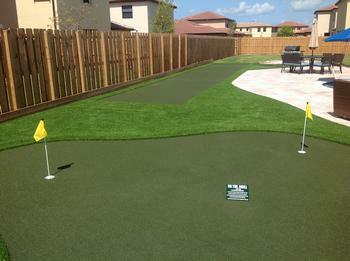 PAR Turf putting green turfs have been installed everywhere from the freezing climates of Canada to the intense heat of our beloved Florida. Click here to see more greens! 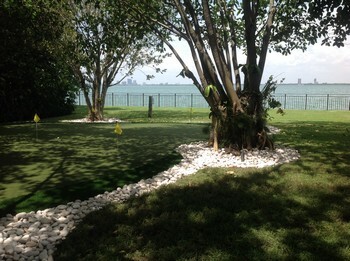 Unlike the original deep sand-filled backyard golf greens which are still widely promoted today, even here in South Florida, our high-tech nylon putting greens don't require the deep sand infill used by others to prop up their inferior putting green turf fibers. 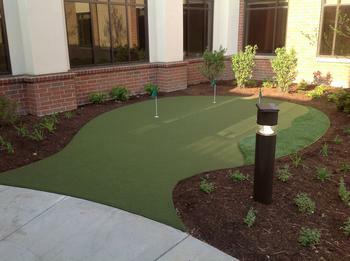 The extremely durable PAR Turf's nylon fibers & proprietary "tufting" process combine to create high performance synthetic putting green turf – for years of realistic putting practice. 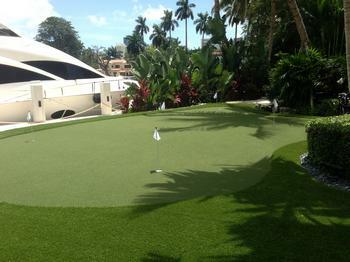 We're so confident, we back PAR Turf putting green turf with an industry-leading 10-year warranty. Transform your yard. Transform your game. 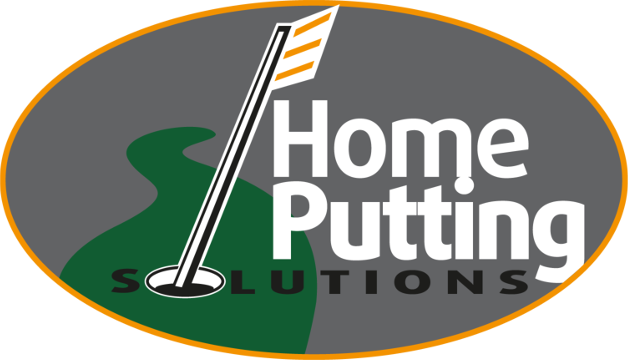 Beyond the value of your family's recreational entertainment, golfers who are serious about golf game improvement will see significant results in their golf scores with a Home Putting Solutions green. Our designs include a variety of short-game practice options, like stand-alone chipping platforms, bunkers and more. In a typical round of golf, the average player accumulates 50-60 chips and putting strokes. Regardless of your full-swing skill, refining your short-game feel and confidence is the surest way to shave strokes from your score on the golf course. Convenient, satisfying golf practice at home – shared with family & friends – will transform your golf scores!